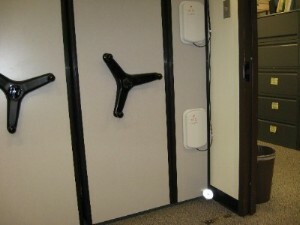 MTM Business Systems' RFID File Room offers a portable RFID Reader to find missing files within the office. End users can look for individual files with the portable reader and locate files without a line of sight. The portable RFID Reader includes a drop-down list of places and people and can be used to periodically inventory 'files in circulation' to keep track of the dynamic movement of records around the office from person to person and place to place. The data from the portable RFID Reader is updated back to Virtual Doxx to refresh views of current file locations. RFID works as a passive technology with readers able to read our patent pending 'RFID+File Label' as the file is moved in and out of the file room. When searching for missing files, our Find a File search using the portable RFID reader allows for an efficient search as the end user can quickly locate a misfiled folder in a shelving system or throughout the office. Inventories of files in the file room and in office spaces have never been completed with more efficiency and speed than with the use of RFID and our portable reader. RFID File Room applications most certainly include a printing station to print and commission our 'RFID+File Label' (patent pending) with the creation of new files. RFID File Tracking Systems have advanced to the point that implementing these systems today is an affordable reality. MTM Business Systems specializes in RFID File Conversions and RFID Tracking applications as an industry leader.